Zooble design and build websites from YOUR perspective and to YOUR requirements, giving you ultimate control over the look and feel of the site, ensuring that you are fully engaged in, and have a sense of ownership over the end solution. quality bespoke graphic design - none of our websites are built from templates, giving you the option to choose which bits you like and piece them together for your perfet site! .......anything you can think of incorporating into your site, then Zooble Technologies' Web Design Team are the company to choose! Whatever your website needs - all our sites are bespoke (not templated) and built to exact customer specifications and business requirements, and therefore Zooble cannot give an exact price without initial customer consultation. Please contact us to arrange an initial meeting to discuss your requirements where we can suggest functional elements and present you with a no obligation proposal and quote. Don't worry if you don't really have any idea of what you want, we can help you with that too! All Zooble websites are designed and tested to meet the latest W3C xhtml & CSS and acessibility standards, but if you have a specific requirement to meet the exact needs of your customers over and above this, then please don't hesitate to ask! To make your new website accessible worldwide, you need to hire space on a web server which has a permanent, reliable internet connection along with adequate available bandwidth. Zooble can provide this service for you. Hosting via Zooble is with a respected third party provider, and provides a physically secure environment with high speed network access, from full 24/7 server monitoring and advanced UPS and firewall management. Once Zooble have created and hosted your website, we can work with you to enhance search engine rankings, suggesting appropriate strategies in relation to your individual business and marketing requirements. We can also provide an Enhanced Search Engine Optimisation service to help your website move up the rankings wherever possible - please contact us for more details and a free, no obligation quote. Contact us now to speak to one of our Web Design Team and get your business website online and working for you! A domain name is the website address that you type into your browser (eg. Internet Explorer) when you wish to visit a particular site. 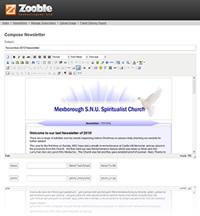 For example, our domain name is 'www.zooble.co.uk'. A unique (and appropriate/professional) business domain name is very important to ensure that customers can find (and remember) your website easily. A potential customer is more likely to remember 'www.yourbusiness.co.uk' than the lengthy free addresses usually provided with free e–mail accounts, such as 'www.yourbusiness.pwp.virginmedia.co.uk' – and it looks far more professional! Domain names typically last for 1 or 2 years, after which they have to be renewed or will be subsequently returned to the market for someone else to buy. Therefore you need to ensure that you continuously manage these accounts effectively. Zooble can help guide you in choosing the correct domain name and can then provide a registration and management/configuration and renewal service, ensuring that you never lose your vital online business identity/name. Zooble can register, host and maintain a domain name for you! We do not charge to administer a domain name on your behalf, but other charges will apply for the actual domain name purchase, hosting of your website and additional extras such as e–mail forwarding and spam filtering. Zooble will host websites that we have created for you or alternatively we can arrange transfer of your existing site onto our servers, saving you money over current hosting solutions - contact us for a free, no obligation hosting quote. Contact us now to speak to one of our Web Team and get your business name recognised worldwide! The purchase of a domain name and hosting will also allow you to have professional–looking e–mail addresses, such as 'John.Smith@yourbusiness.co.uk', through the use of e–mail forwarding, or sales@yourbusiness.co.uk – this can then be configured to drop into your personal e–mail account or accessed via the web from your domain login. An added benefit of this service is that you are free to change your personal Internet Service Provider at any time without having the hassle of notifying customers of change of e–mail or having the costly expense of re–printing letterheads etc. – the e–mail name stays the same! Zooble can easily manage this for you. Using Zooble's eShot Manager Newsletter solution you can keep in touch with all your customers in one go, and in an efficient and cost effective way which helps to keep the planet green! eShot Manager is available in two versions - eShot Manager and eShot Manager Lite, priced accordingly. Once you have your online identity, you could add the option of a complete marketing solution and let Zooble design your letterheads, business cards, and leaflets etc. It's good business sense to have brand continuity throughout your products as they are then more easily recognised throughout the market. In partnership with our quality printers, Zooble can also commission printing of our designs for you, giving you a one-stop solution for all your graphic design and branding requirements.